I haven’t always greeted the new year with open arms. In my far distant past, I got down-right depressed around New Years Eve. This was attributed to many things. It’s the deflation you feel after all the holiday celebrations; family, friends – than nothing. It’s the horror you experience after you jump on the scale after all that over-indulging on that merry wonderful food. It’s the feeling of your own mortality as another year get’s ticked off the calendar of your life. Before marriage, it was also the feeling of extreme loneliness. It was all those things and more that was rolled together to make one depressing night. But have no worries. I no longer feel that way. Soon after meeting my then-boyfriend-now-husband, we decided together to have no more depressing New Year’s Eve nights . We wanted change! We decided on the first year together that we would go dancing. Not just any dancing, but ballroom dancing! We danced the evening away during our first New Year’s Eve together and have never had a depressing New Year’s Eve night since then. While we don’t go dancing every year, we do make each New Year’s Eve night special. This year, we opted to not to leave the house, but instead celebrate in a unique way. 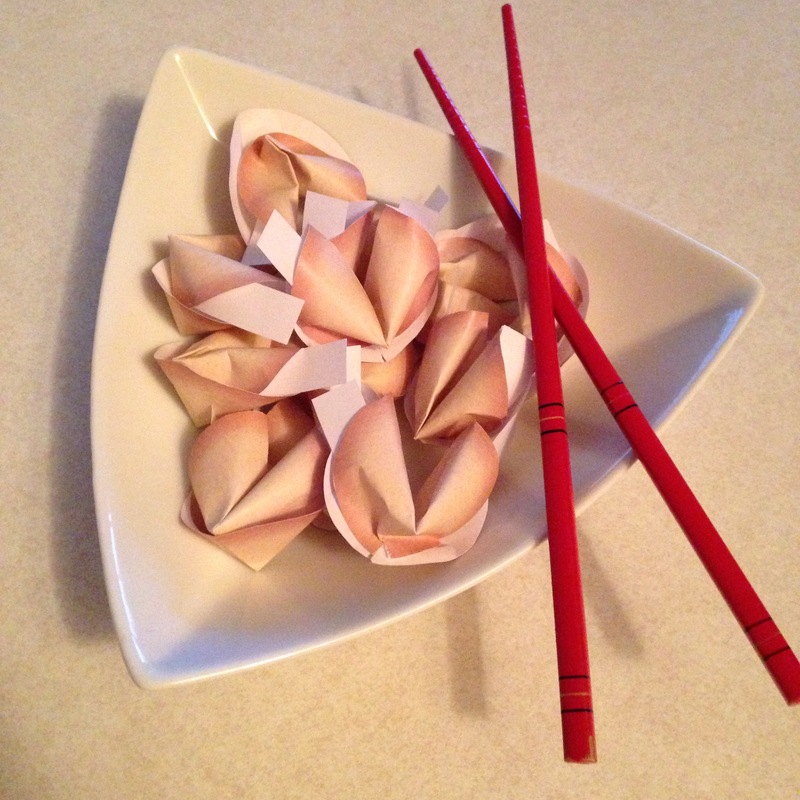 Yesterday I worked on making little origami fortune cookies stuffed with mini-events. Starting at 6pm tonight, we will open one fortune cookie every half-an-hour. Each cookie contains something fun to do for that half hour. Things like: play a video game, watch something funny, read heart-warming stories to each other, dancing and more. I encourage you to share how you will be celebrating this evening. I would love to hear from you! In the meantime, my wish to you is to have a wonderful and safe New Years Eve and hearty welcome to 2016!